Tien-Mou/Taipei City. Japan scored four runs in the top of the fourth to beat host Chinese Taipei 4-2 on Saturday afternoon. 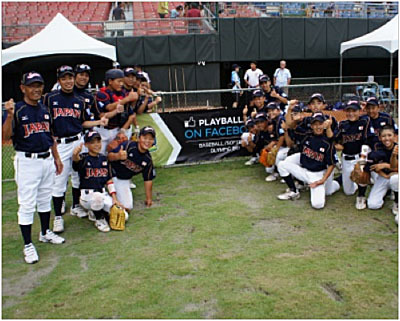 In front of a good crowd at Tien-Mou Stadium the game between the two 2-0 clubs fulfilled the high expectations at the 12U Baseball World Cup. A bases clearing triple eventually decided the outcome. After a pair of scoreless frames Chinese Taipei struck first. A two-out RBI single by Chih-Chun Chen gave them a 1-0 lead in the bottom of the third. But the advantage lasted only a couple of minutes. Japan answered in the top of the fourth and in a big way. They loaded the bases with no outs and Tomoharu Moriya split the outfielders with a perfectly placed hit to the fence in left-center field, clearing the bases and giving Japan the lead. Moriya also crossed the plate when Hirokazu Kikuta grounded out to short. Chinese Taipei countered with a sac fly by Ching-Chieh Chen to cut the deficit to 2-4 in the bottom half of the frame. But the host couldn’t do much afterwards and had to settle for the first loss in the tournament. Kikuta not only helped on offense, but especially on the mound. The right-hander allowed just five hits, two runs and two walks in five innings to pick up the win. Southpaw Kyosuke Yanagida closed it out, pitching around a single in a scoreless sixth. Chinese Taipei’s left-hander Po-Chun Chen pitched a strong game besides the four-run fourth, but still was handed the loss, issuing four hits, four runs and two walks in four frames. Chih-Heng Chiu stopped Japan in the last two innings, but it was not enough as the offense of the defending champion remained quiet as well. Japan hopes to solidify first place in Group A on Sunday, facing Italy in the morning game at Tien-Mou Stadium. In the afternoon Chinese Taipei faces another tough opponent with Mexico. MORIYA. SH - LEE. SF - CHEN CHING. SB - CHIU 2; HU E. CS - NINOMIYA; CHEN L.